I’m sure you all know the feeling. You need that one particular colour, but your stash is so messy that you end up spending endless amounts of time digging through it all to find what you’re looking for. That’s when I realised, I could just as easily make something myself. And today, I finally set myself to work on it. I cut the foamboard in two pieces that fit inside the trunk when laid flat. 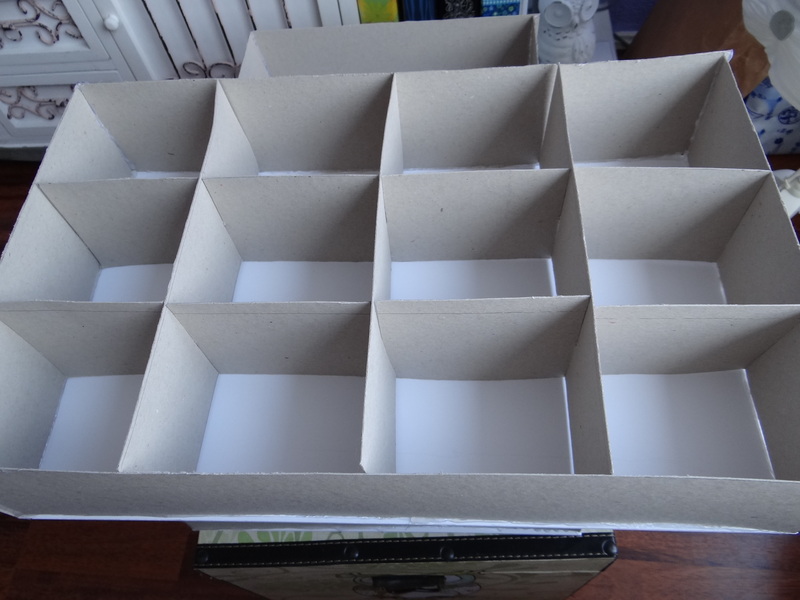 These make the base of the compartments, so I could fit multiple layers inside that were easy to lift up. It’s important that the underside is nice and sturdy, to that it doesn’t bend or break under the weight of the yarn. The dividers don’t need to be as sturdy, so I used the thinner cardboard. It’s actually pretty nice that they give way a little bit, so you can squeeze in that last skein. I think it’s easiest (for me to type and less text for you), if I just show you in pictures how I made the compartments. Time for another cup of tea! The bottom holds a couple skeins that I don’t use very often, since it’s bigger yarn, plus some tiny skeins, needle felting materials and a little bit of stuffing.